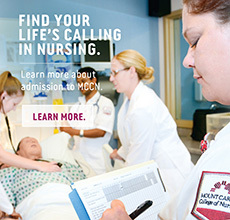 Mount Carmel College of Nursing-Lancaster campus will be entering into its 10th year this coming academic year. I am proud to have led the program for the past five years. Cora Arledge MSN, RN, will be taking over the reins as the program coordinator May 2017. She and I have worked alongside one another for the past year and I am confident progress that we have made will continue and grow under her leadership. Drs. Wynd, Spalla, and Dolan enabled Cora and me to work together this year in efforts towards a seamless transition. We are truly grateful for their support. Cora Arledge, MS, BSEd, RN, who was in the first cohort to graduate from the Mount Carmel College of Nursing-Lancaster campus, steps into the leadership role as program coordinator. “I bring a unique perspective to the role, because I’ve been a student here, have served on the faculty since 2014, and have worked alongside Deidre Smith for the past nine months. I’m excited about taking over her role. I appreciate the time, wisdom and direction that she has provided during the mentor process. This experiential learning has provided insight that will assist my professional profession indefinitely,” she says. Nurses Week 2017 will be celebrated Saturday, May 6 through Friday, May 12, 2017. To all of our wonderful faculty and staff who are Registered Nurses, please be sure to visit the Mount Carmel West Cafeteria on Friday, May 12 between 11 a.m. and 2 p.m. for Florence’s Birthday Celebration. Congratulations to senior Ashae Harris for receiving green light status in Virtual ATI. According to Brenda Beyer, MSN, RN, NCLEX-RN and testing specialist, “Achieving green light status means that Ashae has successfully tested at a level to have a 98% probability of passing NCLEX-RN if she tests within three weeks of achievement.” Ashae is the first to achieve this status while still a student. Way to go, Ashae! The Commission on Collegiate Nursing Education (CCNE) conducted a site visit recently to review the MCCN graduate post master’s certification tracks (FNP and AG-APRN) and the Doctor of Nursing Practice program. Post-visit feedback was largely positive with a final report to be sent to MCCN in October. The CCNE site visit for re-accreditation of the baccalaureate programs and master's programs are due in spring 2022. Are you experiencing anxiety thinking about your final exams? Stop by the Rec Room for a session by William Bumgardner, LPCC-S, LICDC-CS, MCCN outpatient behavioral health clinician, on how to stop the test jitters. Read more: Final Exam Test Anxiety?